(By CSZ Sports Writer Kenn Staub) Clarion Little League (CLL) had a slate of six games scheduled last week (May 7-11) and for once the weather didn’t prove to be an obstacle. Doubleheaders were the rule of thumb, with twin bills played on Tuesday (May 8), Wednesday (May 9), and Friday (May 11). In fact, Week Four was the first of three consecutive weeks where all league games are scheduled to be played as part of a double header. A special feature of Friday evening’s games were the addition of fireworks courtesy of DMS Printing’s Matt Siewicki. Fireworks were launched following the national anthem, each of the evening’s two home runs, and at the end of each game. 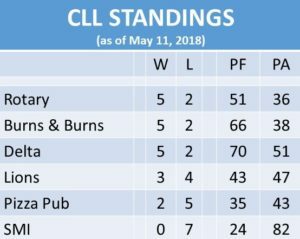 CLL President Brian Smail is hopeful that this can be done every Friday evening, each evening of the league play-offs, and during all-star competition. It was Rotary (Home) downing Burns & Burns (Away) in a meeting of the league’s top two teams. Rotary led 2-1 after the first inning. Burns added three in third to go up 4-2. After holding Burns scoreless in the top of the fourth, Rotary scored three to take a 5-4 lead. Burns tied the game in the top of the fifth, but the Rotarians tacked on four in the bottom of the frame to seal the game. Rotary’s Tommy Smith, who fell a hit short of the cycle the previous Saturday (May 5), again missed it by but one knock, a single. Smith, who rapped out a double, triple, and home run, totaled three RBI as part of his offensive output. Owen Kriebel hit two singles and a triple for Rotary, with Bryce Brinkley adding a double and RBI. The Dawson and Derek Smail provided offensive punch for Burns, Dawson tallying a double and home run and Derek a triple and single. Dawson had two RBI and Derek one. Devon Lauer had a single and double. Kothan Smith hit a single and was credited with an RBI. Logan Lutz, Jase Ferguson, and Jimmy Kerr each singled and doubled for Delta. Ferguson plated two runs. Jayden Siewicki also had a multi-hit game, singling twice. Jesse Siewicki doubled, while Kaden Ferguson and Alex Love each chipped in singles. Pub’s Tanner Miller had a big game for the boys in black and yellow, hitting two doubles, a single, and driving in four runs. Kohen Kemmer doubled and Matt Alston, Nick Aaron, and Kwynton Leadbetter rapped singles. Pizza Pub (Away) bounced back from their loss the evening before to dominate SMI (Home) in a game halted after five innings owing to the ten-run rule. SMI did hold a 1-0 lead after the first, but it was all Pub after that as they scored multiple runs in each of the next four innings. The line score showed Pub with three in the second, two in the third, four in the fourth, and another three in the fifth. SMI added a run in the bottom of the sixth, making the final score 12-2. Nick Aaron had a nice game at the plate for Pub, hitting two singles, a double, and notching two RBI. Kohen Kemmer came through with two doubles and an RBI. Tanner and Parker Miller each knocked two singles, with Parker receiving credit for two RBI and Tanner one. Matt Alston chipped in a single. SMI totaled four hits, with Dauntae Girvan and Brayden Murray each rapping two. Murray had a single and double and Girvan two singles. Girvan drove in a run. In perhaps the game of the week, Lions (Home) scored three in the bottom of the second and limited Rotary (Away) to two in the top of the fourth two win 3-2. Knowledgeable fans of Little League and its pitch limits (and the strategy inherent therein) will find it impressive that each team’s pitcher went the distance. Lions’ Gabe Simko threw 90 pitches in his six innings of work, striking out twelve and walking only one. Bryce Brinkley went five innings for Rotary, throwing 74 pitches. He struck out four and walked two. Brinkley tallied a multi-hit game for Rotary, collecting two singles and a triple. Tommy Smith hit his second homer of the week and had two RBI. Simko supported his effort on the mound with two hits, a single and double. Hayden Weber and Braylon Beckwith both doubled and Brady Pierce and Lucas Mitrosky each singled. 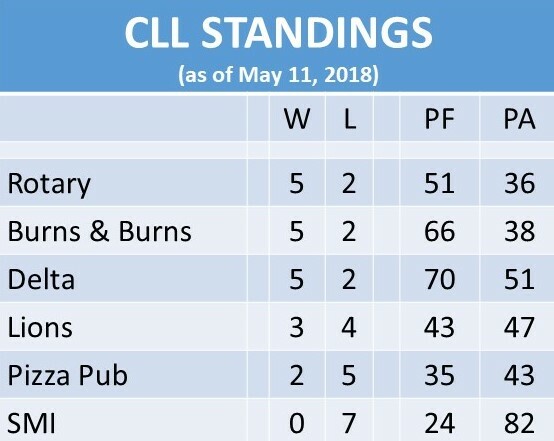 Burns & Burns (Home) rebounded from their loss in the first game of the week to take a 14-4 four inning, ten-run rule victory over SMI (Away). SMI scored two in the top of the first, but it was all Burns after that as they responded with six in the bottom and another eight over the course of the next three innings. SMI added single runs in the third and fourth. SMI’s Brayden Murray homered and singled. He was good for three RBI. Paul Craig, Dauntae Girvan, and Wyatt Watterson all singled. Watterson received credit for an RBI. Derek Smail turned in a three hit performance for Burns, smacking a single and two doubles. Dawson Smail hit his second home run of the week and also singled. Each of the Smail boys had two RBI. Devon Lauer, Kothan Smith, and Dylan Smail all singled. Smith and Smail were each responsible for an RBI. Delta (Home) recorded their second win of the week, taking Friday’s night cap 15-5 in the evening’s second abbreviated four inning, ten-run contest. Lions (Away) and Delta were tied after the first inning. Delta scored four in the bottom of the second, taking a 6-2 lead. Lions responded in the top of the third, cutting Delta’s lead to one, 5-6. Delta turned on the jets after that, scoring five in the bottom of the fourth and adding four in the fourth to seal the mercy-rule win. Brady Pierce singled, tripled, and notched two RBI for Lions. Jake Smith, Braylon Beckwith, and Nathan Frederick all singled. Beckwith had two RBI. Smith was Lions’ starting pitcher, fanning three in two and a third innings. Pierce came on in relief, pitching an inning and striking out one. Jase Ferguson was credited with two home runs and a triple for Delta, collecting five RBI in the process. Jesse Siewicki came through with two triples and a double. He had three RBI. Logan Lutz added a double and RBI.